Microcystic adnexal carcinoma (MAC) was first described as a slowly growing but locally aggressive adnexal neoplasm in 1982. It occurs in those anatomic locations which are functionally and cosmetically remarkable area like face. The diagnostic accuracy plays a vital role in treatment planning for fruitful outcome. However, MAC may be confused with other benign or malignant neoplasms, such as desmoplastic trichoepithelioma, basal cell carcinoma, squamous cell carcinoma, and syringoma due to the similarity in histopathological appearance. Here, we report a case of MAC in a 50-year-old male patient. A 50-year-old male patient presented with multiple small swellings over right side mid face region close to the angle of mouth for 3 years and history of reduced mouth opening for last 2 years [Figure 1]. The nodular mass was gradually increased in size from a pimple like structures. There was no history of any form of tobacco habits. The medical history was noncontributory. 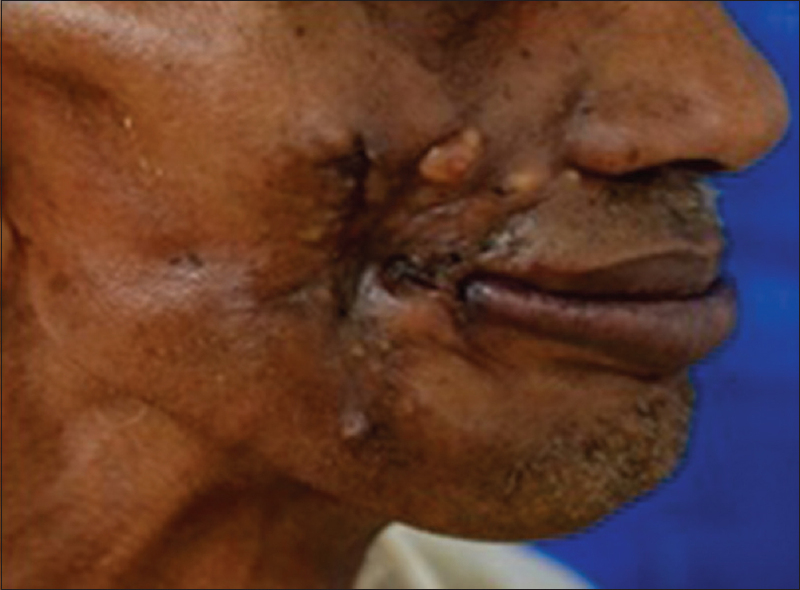 Extraoral findings revealed yellowish firm, smooth, multinodular swelling with an irregular margin over right cheek region with scarring, and intraorally, there was no ulceration, no fibrous bands were noted with <10 mm mouth opening. Incisional biopsy performed and revealed features of MAC. Wide local excision was done [Figure 2]a. Gross examination of the excised specimen showed grayish yellowish firm tissue specimen (m) 3 cm × 2.5 cm with multiple nodular growths on the surface [Figure 2]a. Microscopic examination revealed overlying stratified squamous keratinized epithelium with skin appendages and underlying dense fibrocollagenous stroma having basaloid neoplastic cells with minimal atypia arranged in small nests and cords with keratin filled cyst formation [Figure 2]b and [Figure 2]c. Duct like structures lined by cuboidal cells and neoplastic cells with perineural invasion and infiltration into deeper muscles layers also seen with areas of calcification [Figure 2]d. The above histopathological findings confirmed the diagnosis of MAC. No recurrence was seen after 1-year follow-up. In 1982, Goldstein et al. first described MAC as a distinct histopathologic entity. It belongs to the spectrum of locally aggressive adnexal carcinomas and has recently been proposed to be an apocrine tumor. MAC has also been referred to as malignant syringoma, sweat gland carcinoma with syringomatous features, and sclerosing sweat duct carcinoma. Microscopically, MAC is typically stratified and characterized by a superficial component of keratinous cysts and a deeper component of smaller nests and strands of cells embedded in a markedly hyalinized stroma. However, these features may not be apparent in a superficial shave biopsy specimen. Misdiagnosis of MAC as desmoplastic trichoepithelioma, morphea form basal cell carcinoma, eccrine carcinoma with squamous differentiation or even squamous cell carcinoma has been reported in 30%–52% of cases. In this case report, here, we have given more emphasis on early diagnosis of such uncommon event as compare to basal cell carcinoma and squamous cell carcinoma in head and neck regions as MAC can be cured by an early radical excision of the tumor controlled by Mohs' micrographic surgery (MMS) or histographic surgery. Defects and deformities on the face resulting from wide excision are not avoidable, despite the reconstructive efforts of surgeons. Facial swellings may be the outcome of inflammation, infection, cystic or neoplastic processes, but rare and aggressive skin lesions as in the present case should also be considered in the differentials of facial swellings. The general physician and dentist should be aware of these facts. However, to make this diagnosis, it is imperious that an adequate biopsy to be obtained to demonstrate both its biphasic growth pattern as well as its extensive local invasion. Although the long-term prognosis of these tumors is unknown, most appear to act in a locally aggressive fashion without metastases. As such, the tumor should be completely excised with adequate surgical margins. Goldstein DJ, Barr RJ, Santa Cruz DJ. Microcystic adnexal carcinoma: A distinct clinicopathologic entity. Cancer 1982;50:566-72. Koh SH, Kang KR, Yang JH, Jung SW, Lee HJ. 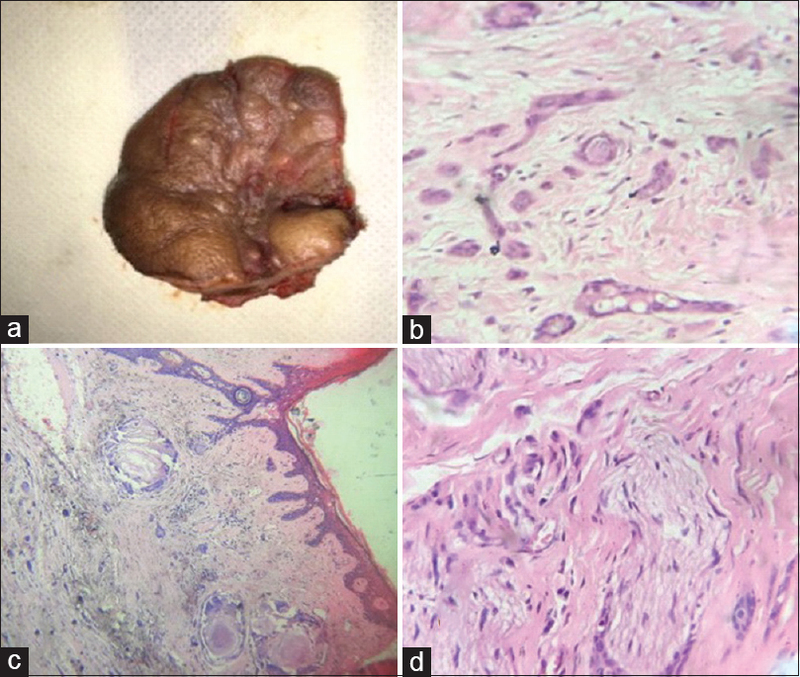 Microcystic adnexal carcinoma misdiagnosed as desmoplastic trichoepithelioma on preoperative biopsy. Arch Craniofac Surg 2015;16:43-6. Fischer S, Breuninger H, Metzler G, Hoffmann J. Microcystic adnexal carcinoma: An often misdiagnosed, locally aggressive growing skin tumor. J Craniofac Surg 2005;16:53-8. Schwarze HP, Loche F, Lamant L, Kuchta J, Bazex J. Microcystic adnexal carcinoma induced by multiple radiation therapy. Int J Dermatol 2000;39:369-72. Hodgson TA, Haricharan AK, Barrett AW, Porter SR. Microcystic adnexal carcinoma: An unusual cause of swelling and paraesthesia of the lower lip. Oral Oncol 2003;39:195-8. Chiller K, Passaro D, Scheuller M, Singer M, McCalmont T, Grekin RC. Microcystic adnexal carcinoma. Forty-eight cases, their treatment, and their outcome. Arch Dermatol 2000;136:1355-9. Ohtsuka H, Nagamatsu S. Microcystic adnexal carcinoma: Review of 51 Japanese patients. Dermatology 2002;204:190-3. Rütten A. Eccrine sweat gland carcinoma of the skin. Pathologe 2002;23:79-88. Abbate M, Zeitouni NC, Seyler M, Hicks W, Loree T, Cheney RT. Clinical course, risk factors, and treatment of microcystic adnexal carcinoma: A short series report. Dermatol Surg 2003;29:1035-8. Diamantis SA, Marks VJ. Mohs micrographic surgery in the treatment of microcystic adnexal carcinoma. Dermatol Clin 2011;29:185-90, viii.